Story Strategy Webinar – Choose and Craft Relevant Stories. Live Webinar on April 19, 2019, 1 pm Eastern Daylight time. Webinar will be recorded for playback. Learn more and register at: Story Strategy Webinar. See below for pre-recorded webinars that you can watch at your convenience. Click here for the complete synopsis of this exciting webinar series! 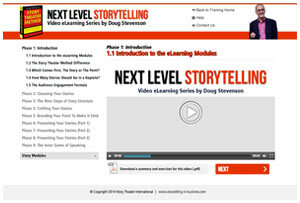 Does your team need a customized Live Webinar tailored to your organization’s storytelling needs?